The aim of this study was to compare terlipressin versus adrenaline in refractory septic shock. In this interventional prospective randomized study, 80 patients between 18 and 60 years of age who presented with refractory septic shock were enrolled. The patients were divided randomly into two groups of 40 patients each. Group A patients were treated with adrenaline and group T patients were treated with terlipressin. The goals of the therapy were to achieve and maintain for 6 h all of the following: (i) mean blood pressure greater than 65 mmHg; (ii) systemic vascular resistance index greater than 1300 dynes s/cm 5 /m 2 ; (iii) cardiac index (CI) greater than 4.0 l/min/m 2 ; and (iv) oxygen delivery index greater than 550 ml/min/m 2 . The patients were classified into responders and nonresponders to the drugs used. The number of responders was significantly higher in the terlipressin group. There were 23 (58.97%) responders in the T group and 13 (35.13%) responders in the A group. The terlipressin group showed a significant increase in mean blood pressure from 49.9 ± 14.82 to 77.79 ± 20 mmHg and a significant increase in systemic vascular resistance index from 898 ± 292 to 1420 ± 537 dynes s/cm 5 /m 2 ; urine output and creatinine clearance also showed an increase. Group T patients showed a significant decrease in heart rate and norepinephrine infusion. 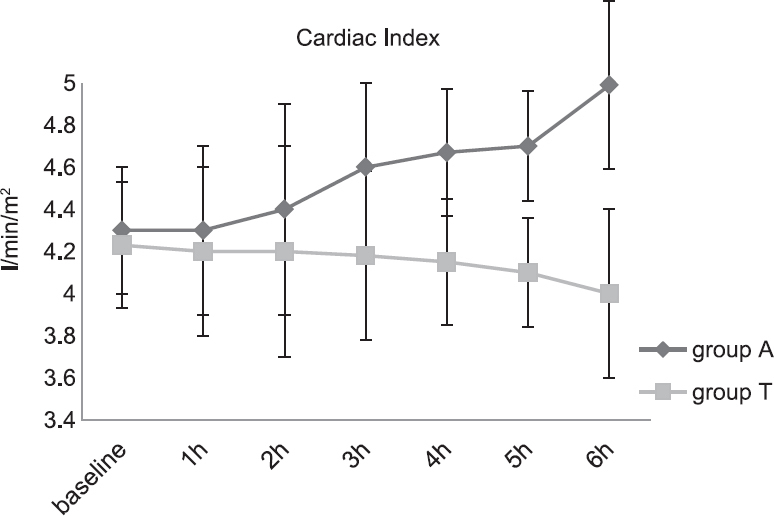 As regards cardiac index and oxygen delivery index, they showed minimal decrease at the end of the study, but their levels were still above our target levels. Terlipressin therapy is better than adrenaline in improving the hemodynamic variables and kidney functions in refractory septic-shock patients. Sepsis is defined as infection and systemic manifestations of infection. Severe sepsis is defined as infection plus infection-induced organ dysfunction or tissue hypoperfusion. Sepsis-induced hypotension is defined as infection-induced decrease in blood pressure [systolic pressure <90 mmHg or mean arterial pressure (MAP) <70 mmHg]. Septic shock is defined as the need for vasopressors after initial fluid resuscitation fails to correct sepsis-induced hypotension [1,2]. Goals of early resuscitation in patients with sepsis include restoration of tissue perfusion, reversal of oxygen supply dependency, and normalization of cellular metabolism. When appropriate fluid administration fails to restore adequate tissue perfusion and arterial pressure, vasopressors are usually necessary to increase mean systemic pressure, cardiac output, and oxygen delivery . Current guidelines recommend the use of norepinephrine (NE) as the first-choice vasopressor [4-6]. When NE fails to achieve the mean blood pressure (MBP) target, epinephrine is added to and potentially substituted for NE. Alternatively, vasopressin up to 0.03 U/min can be added to NE with the intent of either raising MBP or decreasing NE dosage . Terlipressin (Glypressin) is a synthetic analog of vasopressin with similar pharmacodynamic profile but different pharmacokinetic properties. The half-life of arginine vasopressin (AVP) is only 6 min, whereas the half-life of terlipressin is 6 h . Evidence supports its use for the treatment of catecholamine-resistant vasodilatory shock . Despite the fact that terlipressin is increasingly used in clinical practice, as far as we know, there are no clinical trials comparing adrenaline versus terlipressin continuous infusion in refractory septic-shock patients. Thus, the aim of this study was to compare terlipressin versus adrenaline in refractory septic shock and to determine whether terlipressin can be used as first choice after NE or just as an alternative to adrenaline. This interventional prospective randomized double-blinded study was carried out in Ain Shams University Hospitals between May 2012 and August 2014. After medical ethical committee approval and informed written consent obtained from patient's next of kin, 80 patients were enrolled in this study. They were admitted to the general ICU of Ain Shams University Hospitals with septic shock. Patients of both sexes between 18 and 65 years of age were included. The inclusion criteria were as follows: evidence of infection; at least two of the four criteria for systemic inflammatory response syndrome [temperature above 38°C or below 36°C, heart rate (HR) above 90 beats/min, respiratory rate more than 20/min and arterial CO 2 tension less than 32 mmHg or need for mechanical ventilation, polymorph nuclear neutrophil count above 12 × 10 9 cells/l or below 4 × 10 9 cells/l]; and at least two signs of tissue hypoperfusion or organ dysfunction. These signs were defined as a ratio of arterial oxygen tension over inspired fraction of oxygen of less than 280 mmHg, urinary output below 0.5 ml/kg/h or below 30 ml/h (for at least 1 h), or arterial lactate concentration above 2 mmol/l and platelet count below 100 × 10 9 cells/l . In addition, patients had to meet the three following criteria: systolic blood pressure below 90 mmHg or MBP below 70 mmHg; administration of fluid bolus of at least 1000 ml or central venous pressure between 8 and 12 cmH 2 O; and need for more than 0.5 mcg/kg/min of NE to be diagnosed as refractory shock . All patients with severe head injury, stroke, coma, acute coronary artery disease or underlying cardiac dysfunction [cardiac index (CI) <2.2 l/min/m 2 ], severe liver disease (Child-Pugh grade C), chronic renal failure, known hypersensitivity to NE, adrenaline, or terlipressin, those having Raynaud's phenomenon, or a vasospastic diathesis and uncorrected shock due to blood loss were excluded from the study. In addition, pregnant patients were excluded. All patients were intubated and ventilated, so as to maintain PaO 2 more than 60 mmHg and PaCO 2 in the range of 35-40 mmHg. All of them received broad-spectrum antibiotic coverage, and then antibiotics were given according to culture and sensitivity. All patients received corticosteroids (hydrocortisone 50 mg every 6 h) according to Surviving Sepsis Guidelines . Patients enrolled in the study were randomly allocated into two groups according to the vasoactive agent. Randomization was carried out using computer-generated random number tables with closed sealed envelopes. A total of 40 patients received adrenaline infusion as a second-line vasopressor. Adrenaline was given according to the following protocol (0.2 mg/kg/min) . A total of 40 patients received terlipressin (terlipressin acetate, Glypressin; Ferring Pharmaceuticals, Australia) infusion as a second-line vasopressor. Terlipressin was given by means of continuous infusion at a rate of 1.3 mg/kg/h . The goal of therapy (primary endpoint) was to achieve and maintain for 6 h all of the following:. (4) Oxygen delivery index (DO 2 I) more than 550 ml/min/m 2 . This study lasted for only 6 h. At the end of the 6 h the patients were classified into responders and nonresponders to the drug used (The 'responder' is a patient who achieves and maintains all of the predefined goals of therapy for a period of 6 hours in the specified dose). Secondary endpoints were assessment of lactate level, urine output (UOP), creatinine clearance (CrCl), and NE infusion dose. The following data were recorded at baseline: general characteristics; severity of underlying comorbidities according to the McCabe and Jackson classification ; severity of illness according to the APACHE II  and SOFA  scores; and characteristics of infections. Other recorded data include systemic hemodynamics [(MBP (mmHg), HR (beats/min), CI (l/min/m 2 ), and SVRI (dynes s/cm 5 /m 2 )] and metabolic variables [arterial lactate (mmol/l), DO 2 I (ml/min/m 2 )]. Assessment of patients required continuous invasive monitoring of mean arterial blood pressure and central venous pressure, together with continuous assessment of CI, SVRI, and DOI 2 using impedance cardiography noninvasively (Electrical Cardiometry monitors AESCULON, Osypka Medical Gmblt, Berlin, Germany). MBP, HR, CI, SVRI, and DO 2 I were continuously monitored, but we recorded the mean readings every 1 h.
Kidney function was assessed by monitoring UOP and CrCl. An indwelling urinary catheter was inserted in each patient. Simultaneously, creatinine was measured in serum and in 6-h urine collection. Measurements of urine creatinine and serum creatinine in mg/dl and urine flow (UF) rate (V) in ml/min were used to calculate the CrCl in ml/min using the following formula: CrCl=(urine creatinine × V)/(serum creatinine × 240). Clearances were corrected to 1.73 m 2 body surface . UOP was recorded every 1 h and CrCl was recorded at the beginning and at the end of the study. Moreover, the dose of NE infusion was recorded (mg/kg/min) every 1 h. At the end of the study we recorded the number of responders in each group. PASS 11 (Kaysville, Utah) was used for sample size calculation. Data was based on a pilot study in Ain Shams University Hospital ICU, in which a sample size of 37 per group achieved 82% power to detect a difference of 10 mmHg in MBP between the two groups after 6 h with estimated group SDs of 10 and with a significance level () of 0.05000 using a two-sided two-sample t-test; 40 patients per group were included to replace any missing data. The statistical analysis was performed using SPSS software package (version 17; SPSS Inc., Chicago, Illinois, USA). Data were expressed as mean values ± SD, median (interquartile range), and numbers (%). Student's t-test was used to analyze the parametric data, the Mann-Whitney test for nonparametric data, and categorical variables were analyzed using the χ2 -test, with P values less than 0.05 considered statistically significant and P values less than 0.001 considered statistically highly significant. Four patients were excluded from the study as they died before completing the 6 h (three from group A and one from group T), but their exclusion did not make any statistical difference. 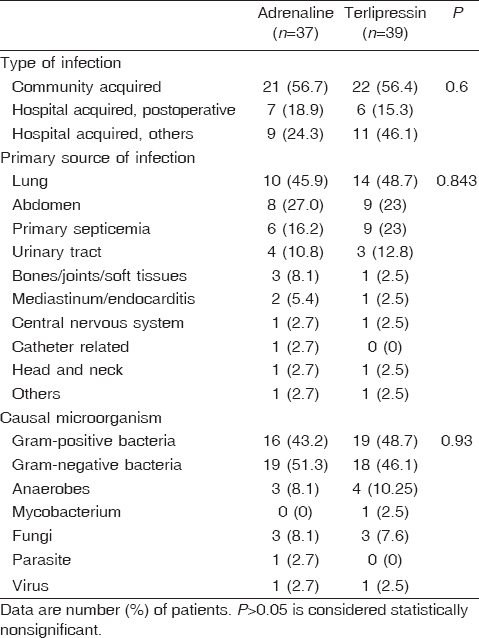 General characteristics at randomization and characteristics of infections in the two groups showed no significant difference, as shown in [Table 1] and [Table 2]. Baseline hemodynamic parameters showed a nonsignificant difference between the studied groups. All hemodynamic parameters showed a significant difference between the two groups at the end of the study [Table 3]. MBP increased significantly in the two groups, although it did not reach the target MBP in group A [Table 3] and [Figure 1]. SVRI increased nonsignificantly in group A. However, in group T there was a significant increase [Table 3] and [Figure 2]. As regards CI, there was a significant increase in group A at the end of the study. However, it showed a nonsignificant decrease in group T [Table 3] and [Figure 3]. HR increased significantly in group A, whereas it showed a significant decrease in group T. As regards UOP, there was a nonsignificant increase in group A [Table 3]. However, group T showed a significant increase [Table 3]. Baseline metabolic parameters showed a nonsignificant difference between the studied groups. DO 2 I showed a significant increase in group A at the end of the study. However, it showed a nonsignificant decrease in group T. There was a significant difference between the two groups at the end of the study, as shown in [Table 4] and [Figure 4]. Lactate increased significantly in group A, whereas it showed a nonsignificant decrease in group T. There was a significant difference between the two groups at the end of the study. As regards CrCl, there was no significant increase in group A, as shown in [Table 4]. However, group T showed a significant increase. There was a significant difference between the two groups at the end of the study, as shown in [Table 4]. As regards NE infusion, baseline NE infusion showed a nonsignificant difference between the two groups (P = 0.9). However, there was a significant difference between the two groups at the end of the study (P < 0.001). 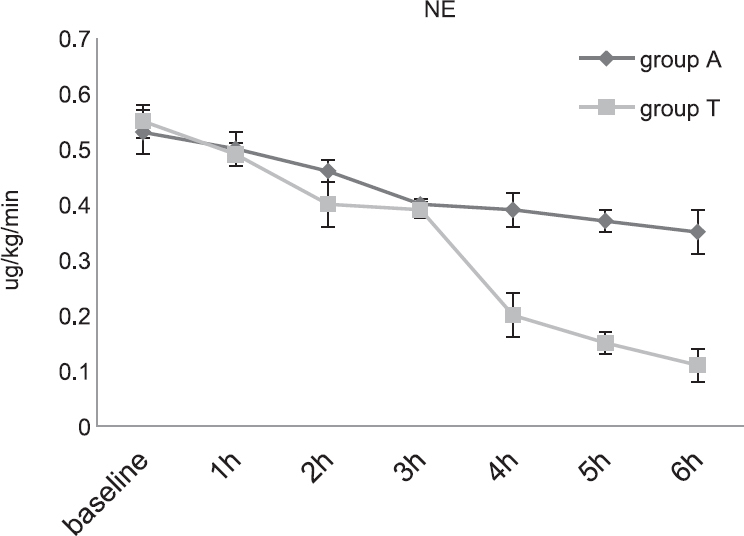 In group T, NE infusion decreased significantly from 0.53 ± 0.03 mg/kg/min at baseline to 0.13 ± 0.03 mg/kg/min after 6 h (P < 0.001). However, in group A, it showed mild nonsignificant decrease from 0.5 23 ± 0.04 mg/kg/min at baseline to 0.38 ± 0.12 mg/kg/min after 6 h (P = 0.46), as shown in [Figure 5]. With regard to the number of responders, there was a significant difference between the two groups (P < 0.001). The number of responders was 23 (58.97%) patients and 13 (35.13%) patients in the groups T and A, respectively. Vasopressor therapy is essential in the management of severe septic shock [15,16]. Although extensively used in adults and children, catecholamines are not free of undesirable effects, and decreased vascular and myocardial sensitivity to catecholamines has been demonstrated in shock . Therefore, alternative and/or complementary vasopressors - namely, AVP, terlipressin, and other future vasopressin analogs - could have a role in reversing severe septic shock states [18,19]. Vasopressin, an endogenously released peptide hormone, has emerged as an adjunct to catecholamines for patients with severe septic shock. The rationale for its use is the relative vasopressin deficiency in patients with septic shock and the hypothesis that exogenously administered vasopressin can restore vascular tone and blood pressure, thereby reducing the need for the use of catecholamines [18,20-22]. The major finding of the present study is that, there was a highly significant difference between the two groups as regards the number of responders (P < 0.001). The number of responders was 23 (58.97%) and 13 (35.13%) in groups T and A, respectively. We choose MBP, SVRI, CI, and DO 2 I to define responders in the present study, as the objectives during treatment of septic shock are two-fold: to maintain oxygen delivery above a critical threshold and to increase MAP to a level that allows distribution of CI sufficient for adequate organ perfusion . It is also well known that peripheral vascular failure may be a major hemodynamic determinant of mortality in septic shock . The contrasting effects of these vasopressors on the number of responders may be explained by the significantly different effects of epinephrine, compared with terlipressin, on SVRI and MBP. As regards MBP in the present study, both terlipressin and adrenaline significantly increased MAP and reduced NE requirement. This finding is in accordance with the study of O'Brien et al. , who used a single 1 mg terlipressin dose in short-lived time study (first hours) on a small number of patients (eight patients). They found that terlipressin caused increase in MBP and decrease in cardiac output and oxygen delivery. There were no reported side effects to terlipressin . 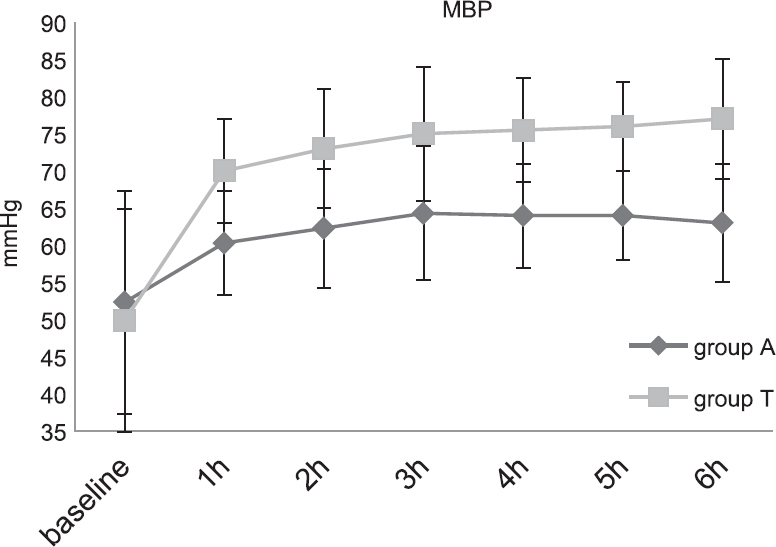 In our study, the increase in MBP from 49.9 ± 14.82 to 77.79 ± 20 mmHg in the terlipressin group allowed us to decrease the NE from 0.53 ± 0.03 mg/kg/min at baseline to 0.13 ± 0.03 mg/kg/min after 6 h, which is considered a significant reduction and also a good therapeutic target, as Luckner et al. reported a positive correlation between high NE dose and mortality. In the adrenaline group, although there was a significant increase in MBP from 52.32 ± 15.9 to 63.5 ± 21.64 mmHg, it did not reach the target MBP (>65 mmHg). Therefore, we were not able to reduce the dose of NE significantly. Vasopressin constricts vascular smooth muscle directly through V1 receptors and also increases responsiveness of the vasculature to catecholamines [20,26]. Vasopressin may also increase blood pressure by inhibition of vascular smooth muscle nitric oxide production and K1-ATP channels . This study is consistent with the study by Leone et al. , who performed a study to determine the effect of one or two boluses of 1 mg terlipressin in refractory septic-shock patients. In all patients, terlipressin induced a significant increase in MAP, systemic vascular resistance, and pulmonary vascular resistance. The increase in MBP was accompanied by a significant decrease in HR and CI. The NE infusion rate was significantly decreased from 3.8 ± 1.3 to 0.7 ± 0.5 mg/kg/min after 24 h .
The current study is in accordance with that by Rodríguez-Núñez et al. , who studied the effect of terlipressin infusion in 15 children with catecholamine-resistant septic shock. They found that the increased median MBP from 48 to 68 mmHg 30 min after terlipressin administration (P < 0.01) allowed for the reduction of NE infusion from 2 mg/kg/min at baseline to 1.3 mg/kg/min at 4 h, and 1 mg/kg/min at 12 h (P < 0.05 vs. baseline in all cases) . In accordance with the present study, Moran et al. used epinephrine as a first-line agent in the management of septic shock and reported a linear relationship between epinephrine dosage and HR, MAP, CI, and oxygen delivery and consumption. As regards SVRI, this study showed a significant difference (P < 0.01) between the two groups. In the terlipressin group, there was a significant increase in SVRI from 898 ± 292 to 1420 ± 537 dynes s/cm 5 /m 2 at the end of the study. 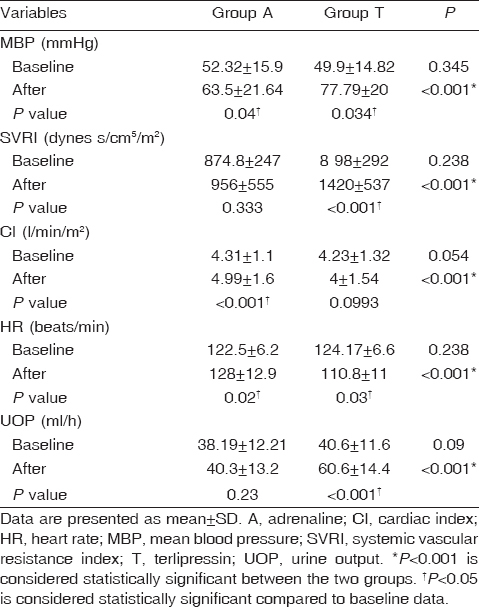 However, in the adrenaline group, SVRI showed only mild nonsignificant increase at the end of the study. 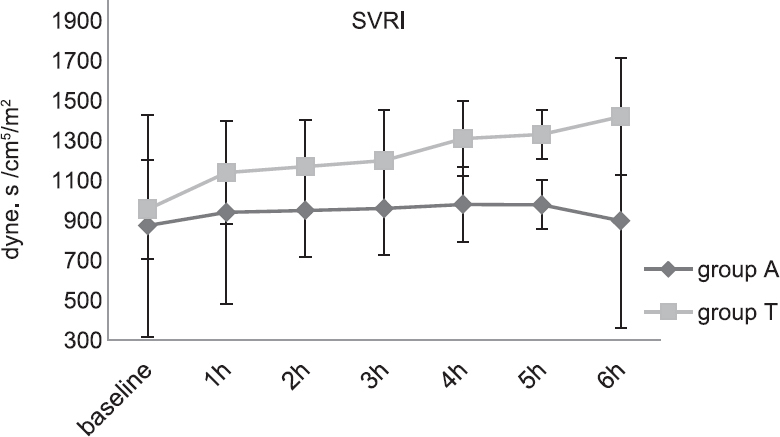 The minimal increase in SVRI in the adrenaline group can be attributed to the diminished vascular responsiveness to catecholamines over time in septic-shock patients due to (i) excessive nitric oxide formation associated with elevation of ATP-sensitive K-channels, (ii) reduction in calcium entry to vascular smooth muscle through voltage-gated calcium channels; and (iii) downregulation of b receptors . The results of Minneci et al. are not in agreement with our results. They compared the effects of three vasopressors (adrenaline, noradrenaline, and vasopressin) in a canine septic-shock model. They found that epinephrine caused greater decreases in CI and ejection fraction (EF), and greater increases in systemic vascular resistance compared with NE and vasopressin. Epinephrine and NE significantly increased MBP compared with controls (P = 0.0002 and 0.0097), whereas vasopressin did not. The differences in some of the results of the current study and the study by Minneci et al. could be attributed to the fact that they did not investigate the effects of vasopressin in conjunction with other vasopressor agents, and it was used as the first vasopressor in the early stage of septic shock. It is well known that endogenous vasopressin increases in the early stage of septic shock and then decreases as septic shock progresses [30,31]. In the current study, there was a significant difference between the two groups as regards CI. In group T, CI decreased nonsignificantly from 4.23 ± 1.32 to 4 ± 1.54 l/min/m 2 , whereas in group A, it showed a significant increase from 4.31 ± 1.1 to 4.99 ± 1.6 l/min/m 2 after 6 h. The drop in CI in group T may be attributed to a baroreceptor activation and increase in left ventricular afterload according to Cowley et al. .
As regards the DO 2 I in the present study, it increased significantly in group A from 568.32 ± 68 to 655.8 ± 74.7515 ml/min/m 2 , whereas in group T there was a nonsignificant decrease from 587.7 ± 67.68 to 579.3 ± 70 ml/min/m 2 . Although DO 2 I showed mild decrease in group T, it was still above our goal of the therapy (>550 ml/m/m 2 ). Unlike our study, other studies [8,33] showed a significant reduction in oxygen delivery with terlipressin. The cause of the minimal decrease in DO 2 I and CI in our study may be attributed to the fact that they used a bolus of 1 mg terlipressin, whereas we chose to use continuous infusion of the drug. It is known that continuous infusion of terlipressin strengthens its positive hemodynamic effects and decreases its side effects [34-36]. That is why in our patients there was a nonsignificant decrease in CI and consequently DO 2 I. In the present study, terlipressin therapy was also associated with a significant drop in HR from 124.17 ± 6.6 to 110.8 ± 11 beats/min after 6 h. However, in group A there was a significant increase in HR at the end of the study from 122.5 ± 6.2 to 128 ± 12.9 beats/min. 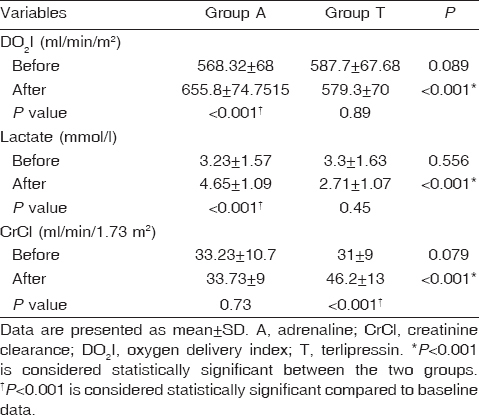 The drop in HR with terlipressin and increase in HR with adrenaline was evident in previous studies [8,29]. The effect of AVP and terlipressin on HR is mostly mediated by V1 receptor in baroreceptors either by increase in baroreceptor gain and excess vagal stimulation or resetting of the baroreceptor to a lower blood pressure level . We could not measure oxygen consumption in our study, but we found that, despite a decrease in oxygen delivery in group T, lactate concentrations decreased nonsignificantly, whereas it showed a significant increase in the adrenaline group. It decreased from 3.3 ± 1.63 to 2.71 ± 1.07 mmol/l in group T and increased from 3.23 ± 1.57 to 4.65 ± 1.09 mmol/l in group A. Westphal et al. reported that lactate concentrations remained constant during terlipressin use. 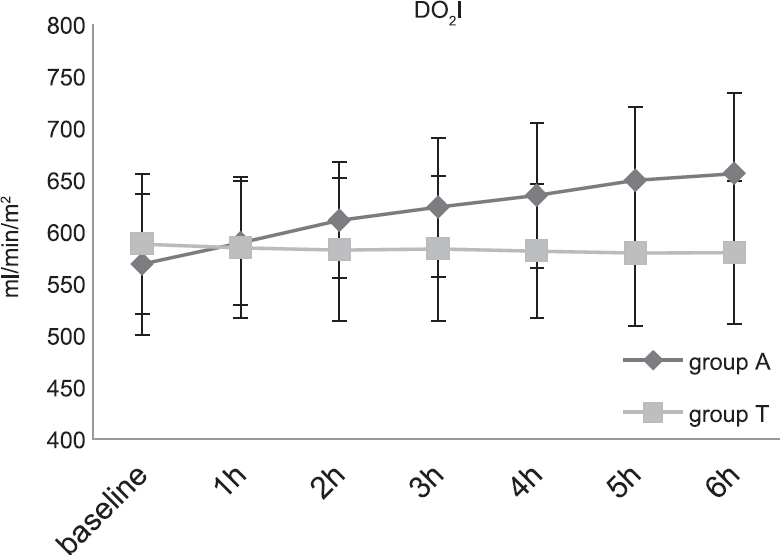 The authors speculated that terlipressin could have modulated the hyperdynamic metabolic response during endotoxemia and exhibited anti-inflammatory effects, thereby decreasing the oxygen needs of the tissues. It is well known that, in human septic shock, epinephrine increases lactate levels and decreases arterial pH . Although epinephrine increases oxygen delivery, oxygen consumption also may be increased. Lactate levels can be increased after the use of epinephrine in sepsis; however, whether this results from excess vasoconstriction and compromised perfusion or increased lactate production remains uncertain . As regards renal function in the current study, which was assessed with UF and CrCl, it was significantly improved in the terlipressin group. UOP increased from 40.6 ± 11.6 to 60.6 ± 14.4 ml/h with concomitant increase in CrCl from 31 ± 9 to 46.2 ± 13 ml/min/1.73 m 2 , whereas in the adrenaline group there was a nonsignificant increase in UOP or in CrCl. Our results are consistent with those of Leone et al. , in which UF was significantly improved and the increase in UF was associated with a significant increase in CrCl and also serum lactate was decreased during the use of terlipressin. This decrease could be related to the re-establishment of UF and the concomitant improvement in renal function. Vasopressin increases resistance in efferent glomerular arterioles and has virtually no effect on afferent glomerular arterioles. It can be speculated that, when administered in septic patients, terlipressin also increases glomerular perfusion pressure and flow and hence the glomerular filtration rate . This study focused on indices of hemodynamic stability and measures of kidney function. No conclusion can be drawn from the present study on whether terlipressin increases survival of septic-shock patients compared with adrenaline. A further concern is that the study duration was short, and so we could not assess the side effects of the drugs used. 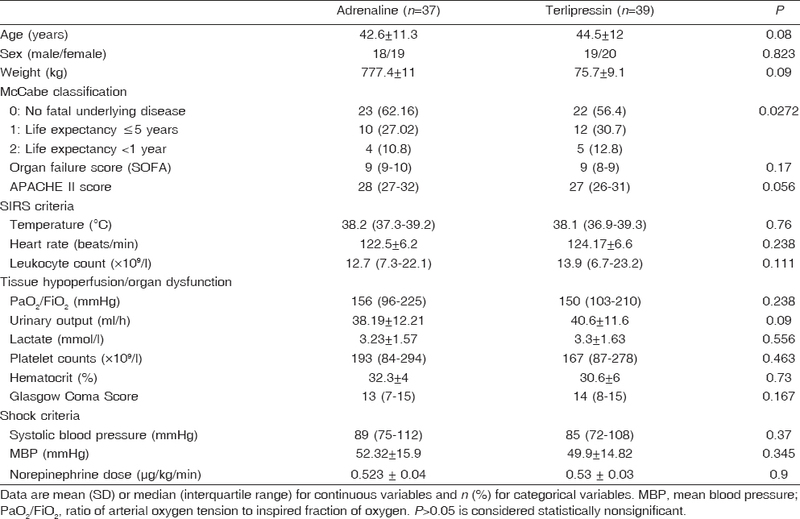 Terlipressin therapy was associated with good improvement in hemodynamic variables and kidney functions more than adrenaline in patients with refractory septic shock despite adequate fluid resuscitation and the use of NE. It must be considered as a second-line vasopressor after NE and not only as alternative to adrenaline. Terlipressin must be used with the minimal effective dose to avoid significant decrease in CI. We recommend that terlipressin infusion and adrenaline be investigated further, both independently and in combination with each other, to further determine their exact place in the therapy of septic shock. Moreover, studies with long duration are a must to evaluate early and late side effects of terlipressin and to weigh its benefits versus its harms in septic shock. Schorr CA, Zanotti S, Dellinger RP. Severe sepsis and septic shock: management and performance improvement. Virulence 2014; 5:190-199. Stanchina ML, Levy MM. Vasoactive drug use in septic shock. Semin Respir Crit Care Med 2004; 25:673-681. Martin C, Viviand X, Leone M, Thirion X. Effect of norepinephrine on the outcome of septic shock. Crit Care Med 2000; 28:2758-2765. De Backer D, Aldecoa C, Njimi H, Vincent JL. Dopamine versus norepinephrine in the treatment of septic shock: a meta-analysis. Crit Care Med 2012; 40:725-730. De Backer D, Biston P, Devriendt J, Madl C, Chochrad D, Aldecoa C, et al. Comparison of dopamine and norepinephrine in the treatment of shock. N Engl J Med 2010; 362:779-789. Blasco V, Leone M, Geissler A, Antonini F, Albanèse J, Martin C. Impact of terlipressin on renal graft function. Shock 2008; 29:667-669. Leone M, Albanese J, Delmas A, Chaabane W, Garnier F, Martin C. Terlipressin in catecholamine-resistant septic shock patients. Shock 2004; 22:314-319. Bassi E, Park M, Pontes Azevedo LC. Therapeutic strategies for high-dose vasopressor-dependent shock. Crit Care Res Pract 2013; 2013:654708. Hollenberg SM. Inotrope and vasopressor therapy of septic shock. Crit Care Clin 2009; 25:781-802. McCabe WA, Jackson GG. Gram negative bacteremia. I. Etiology and ecology. Arch Intern Med 1962; 110: 847-855. Knaus WA, Draper EA, Wagner DP, Zimmerman JE. APACHE II: a severity of disease classification system. Crit Care Med 1985; 13:818-829. Vincent JL, Moreno R, Takala J, Willatts S, De Mendonça A, Bruining H, et al. The SOFA (Sepsis-related Organ Failure Assessment) score to describe organ dysfunction/failure. Intensive Care Med 1996; 22:707-710. Wallach J. Genitourinary diseases, glomerular filtration rate. In: Seigafuse S, et al., eds, editors. Wallach's interpretation of diagnostic tests. Philadelphia, PA: Lippincott Williams & Wilkins, Walters Kluwer business; 2007. 14:797-879. Brierley J, Carcillo JA, Choong K, Cornell T, Decaen A, Deymann A, et al. Clinical practice parameters for hemodynamic support of pediatric and neonatal septic shock. Crit Care Med 2009; 37:666-688. Rodríguez-Núñez A, Oulego-Erroz I, Gil-Antón J, Pérez-Caballero C, López-Herce J, Gaboli M, et al. Continuous terlipressin infusion as rescue treatment in children with refractory septic shock. Ann Pharmacother 2010; 44:1545-1553. Choong K, Bohn D, Fraser DD, Gaboury I, Hutchison JS, Joffe AR, et al. Vasopressin in pediatric vasodilatory shock: a multicenter randomized controlled trial. Am J Respir Crit Care Med 2009; 180:632-639. Russell JA, Walley KR, Singer J, Gordon AC, Hébert PC, Cooper DJ, et al. Vasopressin versus norepinephrine infusion in patients with septic shock. N Engl J Med 2008; 358:877-887. Ertmer C, Rehberg S, Westphal M. Vasopressin analogues in the treatment of shock states: potential pitfalls. Best Pract Res Clin Anaesthesiol 2008; 22:393-406. Holmes CL, Patel BM, Russell JA, Walley KR. Physiology of vasopressin relevant to management of septic shock. Chest 2001; 120:989-1002. Landry DW, Oliver JA. The pathogenesis of vasodilatory shock. N Engl J Med 2001; 345:588-595. Patel BM, Chittock DR, Russell JA, Walley KR. Beneficial effects of short-term vasopressin infusion during severe septic shock. Anesthesiology 2002; 96:576-582. Groeneveld AB, Nauta JJ, Thijs LG. Peripheral vascular resistance in septic shock: its relation to outcome. Intensive Care Med 1988; 14:141-147. Luckner G, Dünser MW, Jochberger S, Mayr VD, Wenzel V, Ulmer H, et al. Arginine vasopressin in 316 patients with advanced vasodilatory shock. Crit Care Med 2005; 33:2659-2666. Barrett BJ, Parfrey PS. Clinical practice: preventing nephropathy induced by contrast medium. N Engl J Med 2006; 354:379-386. Moran JL, O'Fathartaigh MS, Peisach AR, Chapman MJ, Leppard P. Epinephrine as an inotropic agent in septic shock: a dose-profile analysis. Crit Care Med 1993; 21:70-77. Landry DW, Oliver JA. The ATP-sensitive K+channel mediates hypotension in endotoxemia and hypoxic lactic acidosis in dog. J Clin Invest 1992; 89:2071-2074. Minneci PC, Deans KJ, Banks SM, Costello R, Csako G, Eichacker PQ, et al. Differing effects of epinephrine, norepinephrine, and vassopressin on survival in canine model of septic shock. Am J Physiol Heart Circ Physiol 2004; 287:H2545-H2554. den Ouden DT, Meinders AE. Vasopressin: physiology and clinical use in patients with vasodilatory shock: a review. Neth J Med 2005; 63:4-13. Mutlu GM, Factor P. Role of vasopressin in the management of septic shock. Intensive Care Med 2004; 30:1276-1291. Cowley AW, Quillein EQ, Skelton MM. Role of vasopressin in cardiovascular regulation. Fed Proc 1983; 42:3170-3176. Morelli A, Rocco M, Conti G, Orecchioni A, De Gaetano A, Cortese G, et al. Effects of terlipressin on systemic and regional haemodynamics in catecholamine-treated hyperkinetic septic shock. Intensive Care Med 2004; 30:597-604. Morelli A, Ertmer C, Rehberg S, Lange M, Orecchioni A, Cecchini V, et al. Continuous terlipressin versus vasopressin infusion in septic shock (TERLIVAP): a randomized, controlled pilot study. Crit Care 2009; 13:R130. Lange M, Morelli A, Ertmer C, Koehler G, Bröking K, Hucklenbruch C, et al. Continuous versus bolus infusion of terlipressin in ovine endotoxemia. Shock 2007; 28:623-629. Pappof P, Mancuso M, Barbara CS, Moretti C. The role of terlipressin in pediatric septic shock: a review of the literature and personal experience. Int J Immnunopathol Pharmacol 2007; 20:213-221. Luk J. Role of V1 receptors in the action of vasopressin on bavoreceptor reflex control of heart rate. Am J Physiol 1993; 265:R524-R529. Westphal M, Stubbe H, Sielenkämper AW, Borgulya R, Van Aken H, Ball C, et al. Terlipressin dose response in healthy and endotoxemic sheep: impact on cardiopulmonary performance and global oxygen transport. Intens Care Med 2003; 29:301-308. Levy B. Bench-to-bedside review: Is there a place for epinephrine in septic shock? Crit Care 2005, 9:561-565.